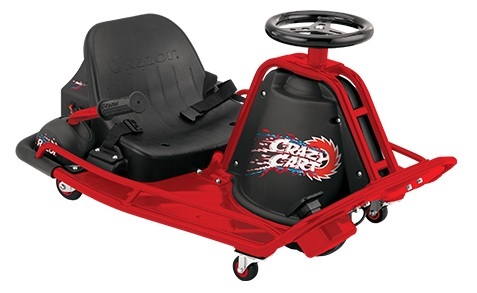 One of the hottest ride-on toys for kids 9+ years old this holiday season has begun appearing in retailers: the Crazy Cart by Razor. This bad boy of drifting carts can be driven conservatively like a go kart, or when you engage the drift bar, it can drive, spin or drift forward, backward, sideways, diagonally – any direction. It’s an exhilarating experience reaching speeds of up to 12 miles per hour, and lasting for up to 40 minutes of continuous use thanks to two dual rechargeable batteries. The Crazy Cart includes a lap/shoulder strap and a flag for safety. Crazy Cart retails for $399, and only comes in red. It is available now at Toys ‘R Us.